In the US, crimson clover is hardy to Zone 6. Established plantings made in early fall can tolerate temperatures to 0F (-18 C) or slightly colder. When using crimson clover to improve very poor soil, mixing a balanced organic fertilizer into the soil before planting will give better results. Using inoculated seed can also help to grow a vigorous stand. Cornflower and Broccoli. Often planted with hardy annual flowers including bachelor buttons and corn poppies. Sow in late summer so that plants can become established before cold weather comes. In cold climates, crimson clover can be planted in early spring instead of fall. Broadcast seed into cultivated soil so that the seeds are about 2 inches (5 cm) apart and one-half inch (1 cm) deep. No thinning is required. 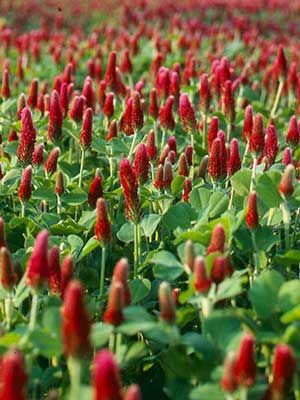 Crimson clover is one of the most beautiful cover crops you can grow. Take down plants just as the red tops begin to fade, but before the plants produce mature seeds. The easiest method is to slice plants off at the soil line with a sharp hoe. They can then be turned under or composted. Nitrogen nodules left behind in the soil add fertility. Crimson clover plants become quite tough as they age, but they seldom regrow when cut off at the soil line.